If you live in Athens, Hocking, or Vinton counties, consider becoming an artist today. No experience is necessary. By joining the Athens Photo Project, you will learn to find creativity, self-expression and renewed purpose in your daily life, all with the support of a peer community. 30-week photography program for adults during the academic year. 10-week photography program for teens during the summer. Classes are two hours long, and meet twice per week. Classes are led by a teaching team including an instructor, peer mentors and volunteers. 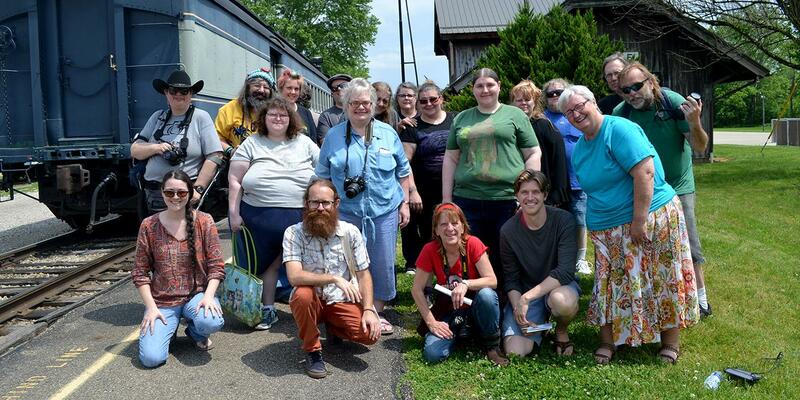 The Athens Photo Project provides mentoring, supplies and a loaned digital SLR camera at no cost to community members living in Athens, Hocking, and Vinton counties in Ohio. No previous experience is required for you to join. Once you’ve completed our Introduction to Photography class, you can take Advanced Photography classes and stay involved for as long as our program continues to serve your mental health goals. Contact a member of your behavioral health support team. Inform them of your interest in Athens Photo Project. Your designated behavioral health support team member will contact us to schedule a studio tour and a meeting with our director and a peer mentor. After the initial tour, you can schedule a formal intake and assessment meeting at Athens Photo Project where you will identify your personal goals. Once accepted, we will inform you of your start date. Please note, our 30-week photography class schedule coincides closely with the academic calendar at Ohio University, so there may be a gap in time between acceptance and your start date. "I shoot from my subconscious, where I feel my mental health issues don’t affect my work. Openly I express myself in these photographs. Expressing myself is living. I cannot live if I don’t have a creative outlet. This class has given me a long overdo freedom of expression."